For a member of Congress looking to boost his or her public profile, there are plenty of options for grabbing a little positive media coverage – kissing babies and eating fried things on sticks at state fairs pop to mind. But elected officials looking for the biggest bang for their buck often turn their attention elsewhere. After all, not everybody likes babies, and an increasing number of Americans are now health-conscious enough to consider things like deep-fried butter at least somewhat alarming. But almost everybody hates the Internal Revenue Service. For that reason, beating up on the IRS has become something approaching a reflex for politicians, including a number of high-profile presidential candidates, like Texas Sen. Ted Cruz, who regularly promises to eliminate the agency if he wins the Oval Office. 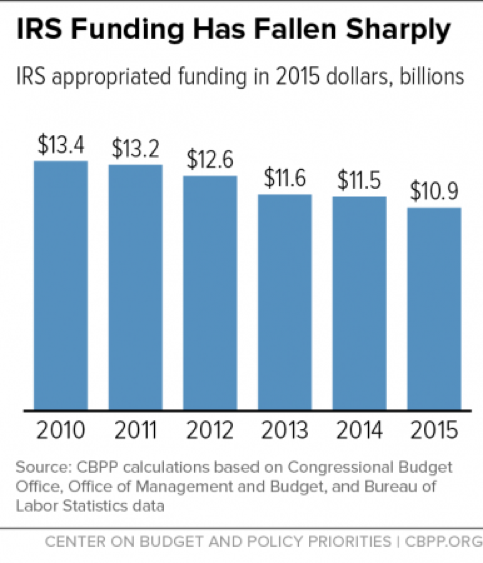 While the constant political attacks may seem like harmless posturing, the fact is that the IRS serves the rather vital function of making sure the federal government has money to pay its bills, and years of legislative chipping away at its capabilities, accelerated in the wake of the targeting scandal that followed the 2012 elections, have made it exceedingly difficult for the agency to perform even its most basic function: making sure Americans pay the taxes that Congress has voted into law. IRS Commissioner John Koskinen hammered that point home this week in a speech before the American Institute of Certified Public Accountants, revealing that the agency is now so low on manpower that there is a less than 1 percent chance that a given tax return will be checked for accuracy. Additionally, taxpayers who call the IRS for assistance now find it somewhere between difficult and impossible to get their questions answered. The agency’s biggest problem is that political opportunism has trumped common sense. Regardless of how much people dislike paying taxes, nobody can credibly argue that the government doesn’t need tax revenue to operate. And, Koskinen pointed out, constant budget cuts at his agency, while politically popular, are absurdly expensive in terms of the amount of federally mandated tax revenue that is simply not collected. “Between 2005 and 2010, the revenue generated from audits averaged $14.7 billion annually,” he said. “But since 2010, it has averaged only $10.5 billion a year, which is a drop of nearly 30 percent, and translates to more than $20 billion in uncollected revenue over the past five years. It’s become politically convenient for members of Congress to behave as though the IRS is some sort of illegitimate, confiscatory machine that each April robs Americans of their hard-earned money. In painting that picture, of course, they conveniently forget that all tax laws originate in Congress, and can’t become law in the first place without the approval of both the House and Senate. Koskinen’s speech likely won’t have much impact on Congressional attitudes toward his agency. But as the House and Senate slog toward inevitable fights over appropriations for federal spending over the next few weeks, it’s worth remembering that many of the same members who will likely be complaining about the country’s fiscal management are actively preventing it from gathering the revenue it needs to honor the obligations they have, themselves, voted for.